When a briefing has been issued, the book icon below will be opened. Click on the open book to view a PDF containing the briefing. "What we are talking about" graphic. Forecast discussions that are issue multiple times a day. 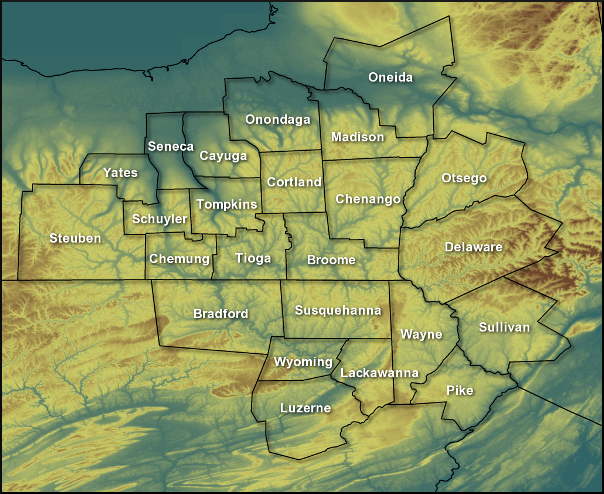 NWS Binghamton weather briefing are for the area show on the map below, this includes 17 counties in New York and 7 counties in Pennsylvania. This includes the cities of Elmira, Ithaca, Rome, Syracuse, Utica, and Scranton and Wilkes-Barre, to name a few.